It’s true, the world is your meal bowl oyster! Once you get the basic formula down you’ll be cranking out meal bowls like a pro with whatever you have on hand. 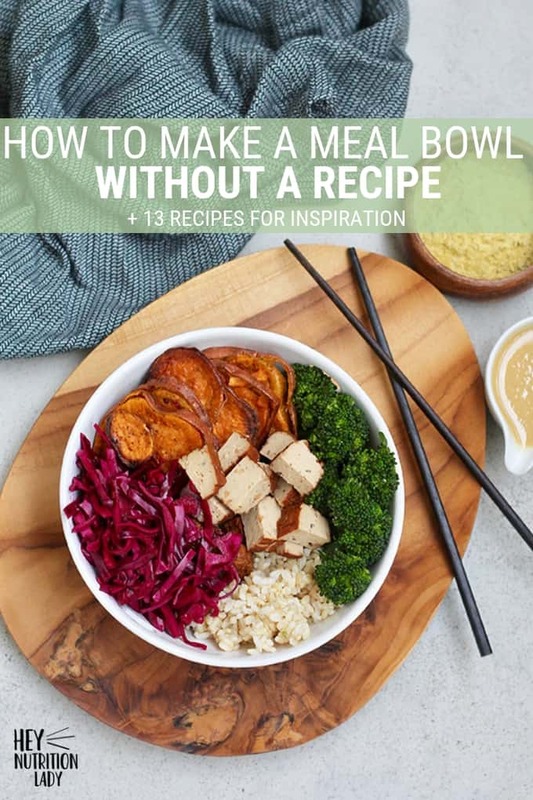 It’s a great way to use up things you’ve already got in your fridge, and if you’re into batch cooking and meal prep, meal bowls are your golden ticket. What is a meal bowl anyways? Wait for it… it’s a meal… in a bowl! Crazy, I know! a sauce of some point. Is a meal bowl warm or cold? I often make my meal bowls cold because I pack ’em for lunch, but there’s absolutely no reason they can’t be served warm. A restaurant in my neighbourhood has a killer meal bowl that’s hot AND cold, with salady stuff on one side and then some stew spooned over quinoa on the other side. Love it! Can I make my meal bowls in advance? I love doing a bunch of batch cooking of meal-bowl friendly stuff, and then either packing them up all at once, or having a selection of build-your-own-meal-bowl ingredients on the ready in the fridge. That way you can cook up big batches of whole grains, roasted vegetables, marinated tofu, and assemble your meal bowl on the fly any old time you want to. What goes into a meal bowl? Any thing you want, my friends! That’s the beauty of meal bowls – they’re designed to be customized just the way you like them. This makes meal bowls the perfect thing to have on offer when you’ve got a group of people with diverse dietary needs and preferences. Got vegetarians? Omnivores? Celiacs? Paleo folk? Just plain picky eaters? No problem! Everyone builds their own bowl the way they want. Thanks for the inspirations Katie. I love meal bowls and regularly include them in my Sunday weekly meal prep. I usually use a recipe and then do a lot of subsitutions based on preferences and what I have in the refigerator. So I guess I’ve been making up my own meal bowls but always considered myself following a recipe. Now I can just wing it and use my favorite ingredients. I do have to shared that I’ve recently got on the cashew cream train and came up with an absolutely delicious version by adding an avocado to the basic recipe. It is so creamy and goes beautifully with meal bowls! Ohhhhhh, that sounds good! I make a chipotle cashew cream that I love, but have never tried blending avocado in. Great idea! Meal bowls are all the rage these days! Thanks for the tips.